Long-time culinary professionals, Rita Held and Rosemary Mark, combine their talents on Get Cooking Simply to share with home cooks their test kitchen expertise and passion for delicious, healthful food—done simply. We have worked for many years with large and small food companies. We develop recipes for product labels, websites, brochures, magazine ads, media campaigns and more. We’ve taught cooking classes, demonstrated clients’ products on TV and radio, and at special events and trade shows. We both have degrees in foods and nutrition, and lots of experience talking and writing about food. We are sticklers for recipes that work, are uncomplicated, and taste great. We have to be if our recipes will be printed on packages, websites and magazine ads. Our creations reflect our clients’ products and our professional reputations. They better be good! “Simplicity with flavor” has been my kitchen mantra since my years in the test kitchens at Del Monte Foods here in San Francisco. While I love to eat and adore good food, I am also terribly practical. An avid enthusiast of fresh fruits and vegetables, whole grains and such, I won’t hesitate to use convenience products to save time if it makes sense and does not compromise the quality of the finished dish. Fairly straight-forward food preparation, even on weekends, is my inclination. But it must taste good! So what are my recipe preferences? I love to sneak in ethnic flavors that surprise the taste buds. I like to break with tradition and do something totally different with Thanksgiving turkey. Except for an occasional indulgence, I shy away from high-fat recipes. And, I’m the queen of tarts – I love vinegar and citrus. Among my favorite dishes are tangy salads, long-simmered meats, one-pan meals, and fruit desserts. Oh… rice and pasta too, any which way! Quinoa? Yes. They’re all so versatile. I’m a member of the International Association of Culinary Professionals, the San Francisco Professional Food Society, and Consumer Business Professionals of San Francisco. I remember as though it were yesterday when my kindergarten teacher said, “Rosemary, you need to play somewhere other than the kitchen or the grocery store”. I was devastated. There was nothing else I wanted to do! Now my kitchen and my client’s R&D facilities are my playgrounds for recipe and product concept development. A dream come true! As a consultant to food companies, I create recipes, new product concepts, and promote clients’ products in cooking classes and trade events. In my product development work, I create on-trend products that stretch the imagination and taste profile within my clients’ target market. In my recipe development work, my goal is to inspire use of a product through a recipe that fits today’s lifestyle, and becomes a favorite to be made again and again. Even though I think about recipes all day for my clients, when it’s time for my family’s dinner, I can be as stressed and tired as anyone and not feel like cooking. (I’ve been known to stop grocery shoppers to ask what’s for their dinner!) I believe the solution to the ‘dinner dilemma’ is a mental cookbook of familiar, easy-to-prepare recipes using pantry staples and seasonal ingredients. My recipes are designed around fresh, available, and healthful ingredients. Our Kitchen Essentials page has some suggestions for useful items to have on hand. I am the Immediate Past-President of the San Francisco Professional Food Society, after holding the Presidency in 2015, and a member of Consumer Business Professionals of San Francisco. 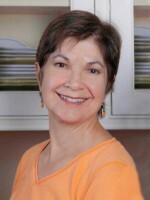 I have been an audio blog contributor to www.amillioncooks.com . Love your blog!! Very professional and the recipes look delicious and easy! Thanks Maureen! From a professional like you we really appreciate your commment! Wow! Loving your new blog. Great cooking ideas from two women I find very talented. Lisa, we’re so glad you like the “flavor” of our blog. Appealing strawberry salsa photo, eh? Rosemary, I’ve just visited this blog for the first time, and it’s wonderful! I’ve added you to my RSS feed. I didn’t know that you and Rita worked together. Rita, we met at IACP last year, and we had a late-night drink at a bar across the street from the hotel. I work in the test kitchen at Wilton in Chicago. Great to reconnect! Hi Beth — Thanks so much for visiting our blog and adding to RSS. Appreciate having another professional in our loop! Rita, Got any good recopes for watermelon rind?